Here are some snazzy birthday facts about 14th of January 1901 that no one tells you about. Don’t wait a minute longer and jump in using the content links below. Average read time of 9 minutes. Enjoy! What day was my birthday Jan 14, 1901? January 14, 1901 was a Monday and it was the 14th day of the year 1901. It was the 2nd Monday of that year. The next time you can reuse your old 1901 calendar will be in 2019. Both calendars will be exactly the same! This is assuming you are not interested in the dates for Easter and other irregular holidays that are based on a lunisolar calendar. There are 267 days left before your next birthday. You will be 119 years old when that day comes. There have been 43,197 days from the day you were born up to today. If you’ve been sleeping 8 hours daily since birth, then you have slept a total of 14,399 days or 39.42 years. You spent 33% of your life sleeping. Since night and day always follow each other, there were precisely 1,463 full moons after you were born up to this day. How many of them did you see? The next full moon that you can see will be on May 18 at 21:13:00 GMT – Saturday. Fun stat: Your first one billion seconds (1,000,000,000) happened sometime on September 22, 1932. If a dog named Harvin - a Norwich Terrier breed, was born on the same date as you then it will be 492 dog years old today. A dog’s first human year is equal to 15 dog years. Dogs age differently depending on breed and size. When you reach the age of 6 Harvin will be 40 dog years old. From that point forward a small-sized dog like Harvin will age 4 dog years for every human year. Andrew III of Hungary dies, ending the Árpád dynasty in Hungary. Napoleon III of France escapes an assassination attempt. World War II: Japan begins Operation Ke, the successful operation to evacuate its forces from Guadalcanal during the Guadalcanal Campaign. The first prototype of the MiG-17 makes its maiden flight. The national flag of the Republic of Georgia, the so-called “five cross flag”, is restored to official use after a hiatus of some 500 years. Former president of Tunisia, Zine El Abidine Ben Ali flees his country to Saudi Arabia after a series of street demonstrations against his regime and corrupt policies, asking for freedom, rights and democracy, considered as the anniversary of the Tunisian Revolution and the birth of the Arab Spring. What does my birthday January 14, 1901 mean? 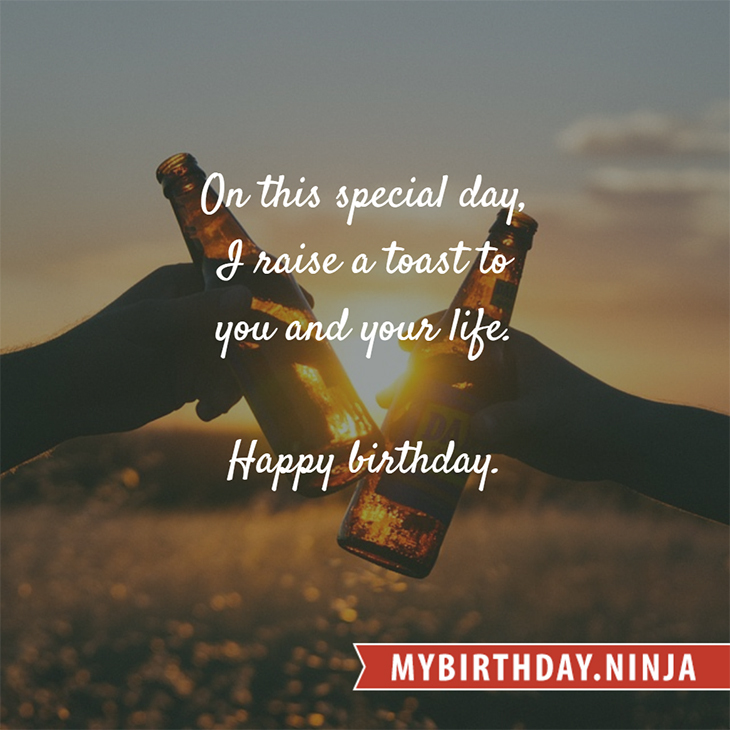 Your birthday numbers 1, 14, and 1901 reveal that your Life Path number is 8. It represents experience, authority and endeavour. You are gifted with natural leadership and the capacity to accumulate great wealth. The following celebrities also have the same life path number: Alice Krige, Penélope Cruz, John Riggins, Glen Benton, Michaela Watkins, Zack Snyder, Lee Harding, Paula Devicq, Aileen Pringle, Eddie Kirkland. 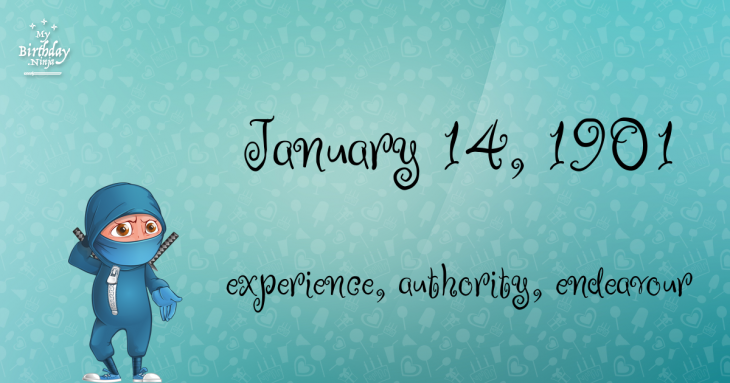 What is the birthday horoscope for Jan 14, 1901? The Western zodiac or sun sign of a person born on January 14 is Capricorn ♑ (The Sea-goat) – a cardinal sign with Earth as Western element. The ruling planet is Saturn – the planet of discipline. According to the ancient art of Chinese astrology (or Eastern zodiac), Rat is the mythical animal and Metal is the Eastern element of a person born on January 14, 1901. Fun fact: The birth flower for 14th January 1901 is Carnation for friendship. What is the Love Match for Jan 14, 1901? When it comes to love and relationship, you are most compatible with a person born on August 21, 1908. You have a Love Match compatibility score of +126. Imagine being in love with your soul mate. On the negative side, you are most incompatible with a person born on May 28, 1911. Your incompatibility score is -140. You’ll be like a cat and a dog on a love-hate relationship. Arf-arf, I want to bite you. Meow-meow, stay away from me! What is the popular baby name on 14 Jan 1901? Here’s a quick list of all the fun birthday facts about January 14, 1901. Celebrities, famous birthdays, historical events, and past life were excluded. Try another birth date of someone you know or try the birthday of these celebrities: December 30, 1956 – Suzy Bogguss, American singer-songwriter and guitarist; August 14, 1942 – Willie Dunn, Canadian singer-songwriter and producer (d. 2013); July 24, 1979 – Lee Si-yeon, South Korean actress and model.